Why would a mimic be a con artist? Also, most people forget that D&D mimics are intelligent, and will usually try to con the players through fast-talking instead of attacking them. My experience with mimics, both as a player and as a DM, are extremely limited (I think one in the ~10 years I've been playing). 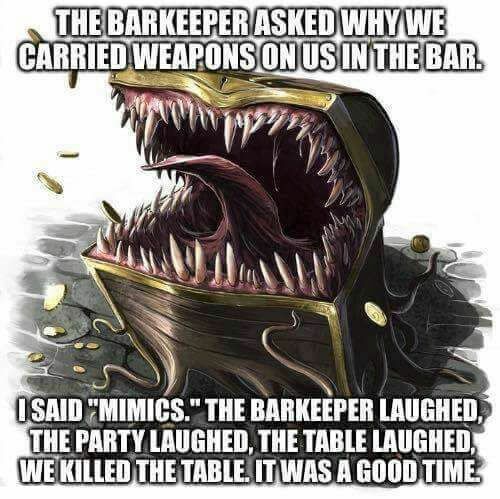 I just assumed that mimics ate adventurers, but now I'm picturing mimics to be a fast talking wise guy from the twenties trying to talk someone out of their bag of holding. What would a mimic try to con from adventurers if they don't eat their quarry? There are different types of mimic. Hence according to this article, many mimics are of the well-known variety which simply disguise as a chest or other item and hope to kill and eat adventurers, but there is another sort, generally smaller and weaker, who will rather bargain for food or safety. There are two varieties of this creature, the large (9-10 dice), semi-intelligent carnivorous "killer mimic" and the slightly smaller, intelligent sort. While the former will attack anything which is nearby, the latter are generally friendly if offered food. ... The killer mimics do not speak, but the other breeds have their own language and can usually speak several other tongues such as common, orcish, etc. For consideration they will usually tell a party about what they have seen nearby. Not the answer you're looking for? Browse other questions tagged monsters dungeons-and-dragons lore or ask your own question. Why are elves immune to a ghoul's paralyzing touch? Could a mimic imitate a door? How and why does Vecna's curse transform wizards into Nothics? How would you sever the material plane from the rest? Can a Mimic mimic another creature? Can a mimic attack while grappling? Does attacking a mimic stick your weapon to it? Why is Waterdeep known as the City of Splendors? Good Resources for Making Custom Artwork for a Non-Artist?